A great nation does not form in the air. For the formation of a great nation its people have to go through big struggles, and great sacrifices. The Nepalese people have appeared sharp and radiant many times in the ordeals of sacrifices continuously from the time around 1950 till today. Regularly for ten years in the past, the best sons and daughters of Nepali people have shed their blood in course of the great people’s War, and in the same course the Nepalese people have developed a great new thought. The great thought that arose out of the sacrifices has begun quite a new process of the formation of new Nepal. The twelve point agreement was a wonderful and unprecedented type of understanding in history. The twentieth century never saw such a type of unique understanding that has been proved in history. Long way up to this period of history, the thought that felt responsibility towards the nation and its people with the great sacrifices in order to fulfil the people’s aspirations of peaceful transformation, and the same thought valorously opened a new front of the struggle as a new process of sacrifice. The thought has arisen upon a strong pedestal of the sacrifices of the great martyrs. The thought is built from the blood of thousand wounded warriors. The thought has been invented by the contributions of thousands of revolutionaries who were taken in disappearance by the state. The same thought synthesized all thoughts of the 20th century above all the thought process by initiating totally a new movement guided by the same thought we forwarded the concept of the constituent Assembly, the concept of the republic and the vision of the advanced restructuring of the state. Likewise, we spoke for the solution to the racial, gender, regional and class problems. We transformed the war into peace. We came forward to an absolutely new frontier of struggle. The whole world fell flat. To see the miracle of the Nepalese people’s movement and their initiatives, many so called big world powers and so called big scholars felt terrorised. Maoist and mortify it to its total destruction but we put every conspiracy aside and moved forward from the labyrinth. During the course we had to face a heinous Gaur massacre. We kept patience. Now the country has been a hostage of political deadlock. Our people’s liberation army is now in the cantonment. Any foreign politician, who has any human feeling, would say that the commanders of the people’s liberation army that have arduously fought in the frontiers for ten years are deprived of the basic human needs living in the middle of the jungles in the inhumane conditions. Now, YCL is being tagged as a synonym of terror. We had only started the process of transformation of the society that you see in the communication media that the YCL has involved itself in the activities of collecting dirt and garbage, widening the encroached roads, facilitating traffic like creative and constructive deeds, when a few technical incidents have been scandalized to spread terror against the YCL. We are witnessing that in the villages there are attempts of conspiracy of spreading terror with not evidential claims. What we are repeatedly saying is that the 8 party alliance must not be broken. There are still some alternatives, truly to say there is still a way out to transform the nation into New Nepal in a peaceful way. Therefore, we have been saying let’s declare republic from the interim parliament and fix the date for the constituent assembly election. This can only be the strong base for the new unity of the 8 party political solidarity. The Constituent Assembly election is not only for the declaration of the republic, but also for the new and advanced formation of the nation. The problems of classes, races, regions, gender is the great work of constructing prosperous nation by establishing the sovereign power to the people. Therefore, let’s declare the republic from 8 party alliance, from interim parliament. Let’s announce the people for the rally of our victory. If the feudal regressive elements are not ready to abandon the palace, we don’t need the whole army but the appeal of 8 parties to the mass of Nepalese people is more than sufficient, which will sweep away all conspiracies of the regressive elements. the constituent assembly election failed to take place in mid-June 2007. The old base of unity of 12 point agreement has been broken and new base must be looked for. The only new base can be the declaration of republic from the parliament. We are not longing again for the war. We are envisioning the development of revolution by considering the peoples’ desire for peace and all present international situation. Maoism is a potential thought. It is an absolutely a new thought in Nepal. This is not only a new thought for Nepal but also to the whole present day world. I have, time and again, said in the public that we will be flexible to the extreme and equally rigid to the extreme if it needs to be. The regressive and the reactionary elements even with the 8 parties seem to have taken our flexibility and accountability as our weakness. They have tried to take it as an ordeal of ours. This is also going to the extreme. If they don’t understand our sense of accountability, our measures for constructing new nation and our flexibility, CPN (Maoist) will burst out in the cabinet, in the cantonment and in the parliament. Does any body have the guts to stop it? 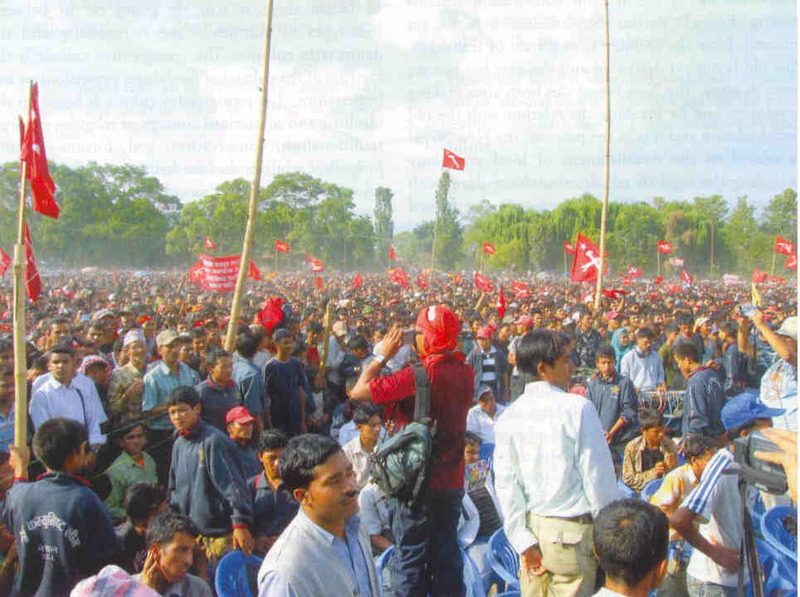 For the reactionary the thought of the CPN (Maoist) is not easy to tackle with. Maoist won’t be easy for the reactionaries. If they have thought it easy of thinking that they have brought the Maoist, included and inserted it, hark now! It is not easy. If anybody wants to witness our harshness, come in front openly. We don’t want those who consider our accountability as a weakness, who run after foreign gesticulations, and those who want to make our mother land Nepal as a playing ground of foreign games. We don’t want them. down. We will never tolerate, on case we are undermined. Medhesi movement, Chure Bhawar etc in building a great nation and a great thought. We can solve these problems in a minute. We want that nobody should try to take our test any longer; no more test of our patience and flexibility. It will be costly for the reactionaries. We are not here to bow down. at several places. Does it not have to be taken into account? Friends of journalism, isn’t it a way to push the Maoist into the war by continuously blaming the party? Are we responsible not to hold the constituent election? We have kept our fighters in the cantonment for the last five months. Many of them have been crushed under the fallen trees in the storms many are killed by the snake bite. Many PLA fighters have to remain awake at nights to watch the snakes crawling into the cantonments. Don’t you have to focus on such pathetic conditions, journalist friends! Don’t you have to write about it? Why do you follow the corrupt ones who have mustered millions and billions of rupees? the villain is coming up. If the eight parties did not understand in time, I would like to announce you, that there will certainly be a new type of fight. It will be a great war of the 21st century. The history will witness, the world will see it. Over the past ten years Nepal had done a miracle. Next miracle was in the 19 day movement and it will make third miracle too, and give a new message to the world. Therefore, let’s not believe the false propaganda of the reactionaries and revivalists. We are going to give a trailer of the programmes of the movement. For 12th to 25th of Baisakh, there will be a trailer of publicity and from 25th to the first week of Baisakh there will be a trailer of peoples’ mobilization. Even if the eight party alliance does not realize, there will be the show of the real film. No force of the world will be able to stop us.